INTERNET: BRÜSSZEL DÖNTÖTT! EZ TÉGED IS ÉRINT! JÖN! 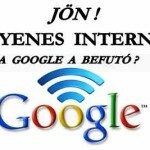 INGYENES INTERNET! A GOOGLE A BEFUTÓ?